I follow many foodie accounts on Instagram and about a year ago, a few ladies prepared this baked salmon dish and made spring rolls with their family and friends. The pictures looked super mouth-watering and was ridiculously easy to make. The dish also includes some of my favorite toppings on fish. I think that the combination of crushed peanuts, fried shallots, and scallion oil is freaking awesome and the extra layer of texture and crunch elevates the overall taste of the salmon. The first time I tried this out, the family loved it and I have also done this a few time with friends and they loved it as well. The most recent time I made it, I made it for some of my he friends who never rolled their own spring rolls before (can you guess who from the picture below?) 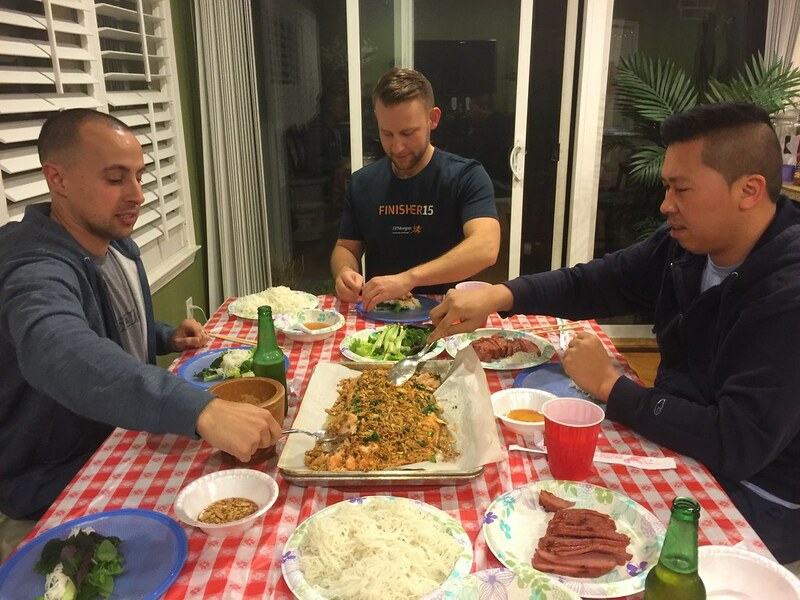 and they were surprised how tasty the salmon turned out and enjoyed how fun spring roll parties can be. I typically bake it in oven, but I have also made this on the Weber grill a few times and it worked quite well. To make on the BBQ grill, just cook it on indirect heat for about 25-30 minutes or until it’s opaque and flaky. Season Salmon- Slather salmon with some olive oil and season with salt and pepper. Marinate for at least 30 minutes. Bake Salmon- Preheat the oven to 425 degrees. Bake salmon for about 20-25 minutes. 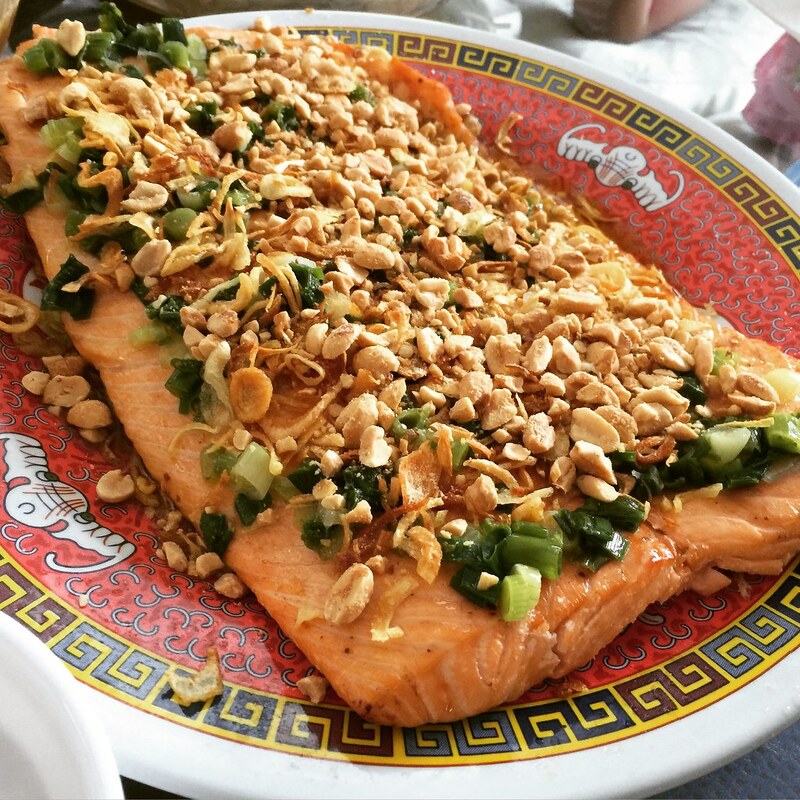 Top Salmon- Top salmon with generous portions of crushed roasted peanuts, fried shallots, and scallion oil. Spring Roll Party – Create your own spring roll with your favorite accompaniments, dip in sauce, and enjoy! To make on the grill, cook the fish over indirect heat for 25-30 minutes or until the fish is opaque and flaky. I tried this with halibut and sea bass, but I prefer salmon. If you do use another fish, use a flaky fish. The spring roll ingredients I listed are what I like at my house. Substitute with herbs and greens you like. The options are endless. Load the fish with lots and lots of toppings. The more the better. For the salt, I do slightly less than 1/2 teaspoon of kosher salt per pound of salmon. I wouldn’t do more than that because you will be dipping it in some sauce. If you don’t have time for a spring roll party, eat it with vermicelli noodles and it will still be great.